The entire Jason Bourne film franchise will soon be available on 4k Ultra HD Blu-ray Disc, arriving day-and-date with the release of Jason Bourne to Blu-ray and Ultra HD Blu-ray on December 6, 2016. Each of the past Bourne films: The Bourne Identity (2002), The Bourne Supremacy (2004), The Bourne Ultimatum (2007), The Bourne Legacy (2012), and the latest addition Jason Bourne (2016) will feature HDR (High Dynamic Range) video encoded with the HDR10 color specification. And, the soundtrack to each title is provided in English DTS-X Immersive Audio, as well as alternative tracks in DTS-HD Master Audio and DTS Surround 5.1. Video on the Ultra HD Blu-ray editions is formatted in 2160p at 2.40:1 widescreen aspect ratio, labeled with the Ultra HD Premium logo indicating HDR color range. 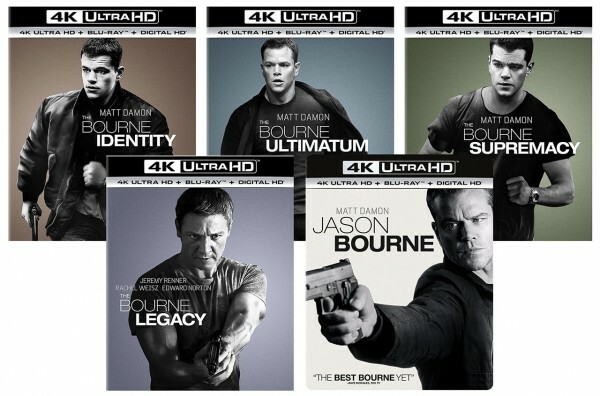 The packaging for the 4k Blu-ray editions is newly designed with black and white action shots of Matt Damon on every cover (except for The Bourne Legacy featuring Jeremy Renner). And, along with extra bonus material each 2-disc edition includes a 1080p Blu-ray copy and Digital HD copy with iTunes or UltraViolet. Pre-orders of the new 4k Ultra HD Blu-ray editions from Universal Pictures Home Entertainment are currently priced $39.99 (The Bourne Supremacy, The Bourne Legacy, The Bourne Ultimatum), $29.99 (The Bourne Identity), and $26.99 (Jason Bourne).